Almost two months have passed since Sukanya Samriddhi Account, SSA, Yojana was launched in India and we can see lot of enthusiasm among people for this scheme. The Reserve Bank of India has already issued a list of authorized banks that would be opening SSA as a service; however, banks are not yet sure on how to proceed. Moreover, there are lots of people who are searching for a list of banks that would be dealing in Sukanya Samriddhi Account. The list of authorized banks include almost all public sector banks along with few private banks like ICICI bank and Axis Bank. As per directions from RBI, following banks would be working under guidance from Central Account Section for appropriate arrangements to make sure that Sukanya Samriddhi Yojana transactions are started with immediate effect. As of now, the list include the above mentioned banks and post offices, however, since the scheme is a floating scheme, we can expect few more additions and changes to the list, from year to year. 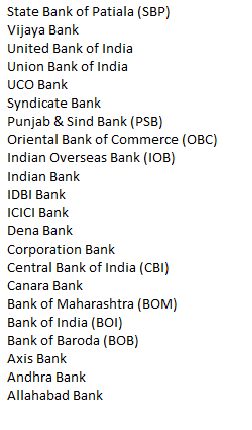 In most of these banks, you can walk up to the concerned officials with relevant documents and get Sukanya Samriddhi Account opened under your girl child’s name. You can either take along the form which you have downloaded from internet or get the form from the bank itself and duly fill it to open the account. I don’t see Hdfc listed, but when I visited Hdfc they too have listed it on their bank website. So is it safe to open SSY on hdfc ? Hello Sir, I’ve opened Sukanya account on post office. But unfortunately there is no online transaction system. Pls do the needful. i opened two ssa a/c in my daughters name and deposit money thr post office . now wish to deposit thr online . i have an account with union bank of india .how i can do the txn by online thr ubi? post office does not have any online facility. You will have to transfer you account to any of the banks that have online facility. I have my daughter birth certificate of her name on it, But she is having aadhar card by some dummy name, since we had finalized her name on birth certificate. Can we open on that basis. best way is to get your aadhar card updated. please ask for a passbook from them.